I pulled out the Nikon D700 and did a little shooting in the grungier part of downtown Tupelo this morning. It was overcast and cool, with some good dark clouds for HDR processing. Most of my shooting was done in 7-bracket sets, but there are some times when you just can’t shoot brackets because things are moving too fast. This shot is just such an example. 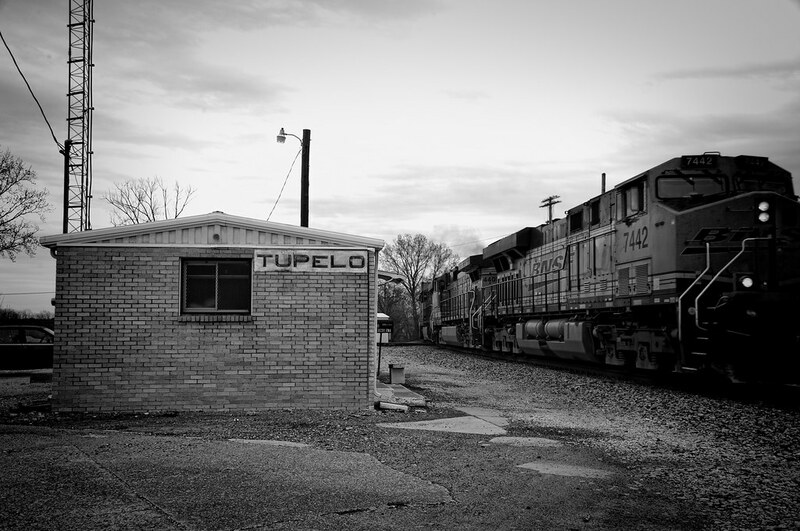 I wanted to get a shot of the little Tupelo train station, so I drove over the tracks and parked at the farmers’ market pavilion next to the station. I was just getting my camera and tripod out of the car when I heard the blast of the train horn (can’t really call them “whistles”), and saw that there was a train headed my way. I made some quick adjustments to the camera settings, turning off the bracketing settings and changing the F/stop to get a wider depth of field, I got the camera mounted on the tripod just as the camera came around the curve and headed for the station, and then I just started clicking. I hadn’t even thought about how close to the tracks I was until the train was right beside me. IT WAS LOUD!! I could actually feel the ground shaking as the engines went by. It was AWESOME!! That’s one of the things I love about photography, and especially about digital processing–if you’re not working for a paying customer, there is really no right or wrong way to process an image. And there are so many different ways to interpret your photos, you could spend hours or days just trying different effects. Don’t be afraid to experiment and try something outrageous–if you like what you do, who’s to say it’s not perfect? 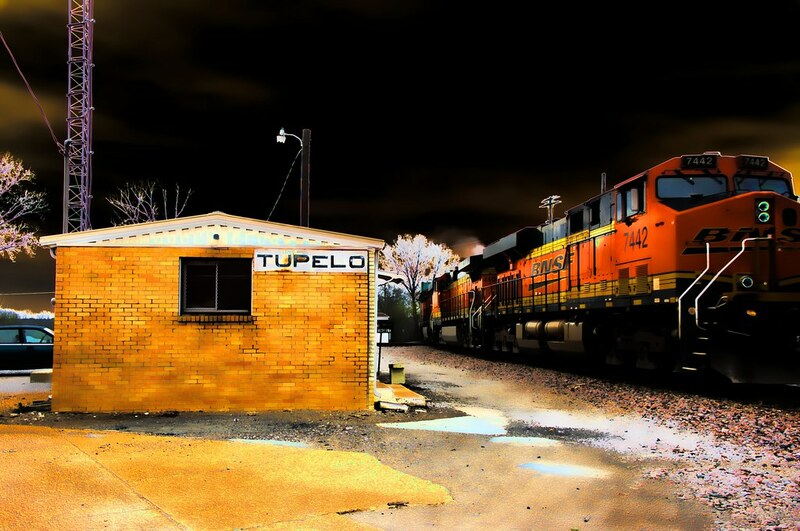 This entry was posted in Commentary, Processing and tagged 28-300mm, D700, Mississippi, Nikon, photography, station, Topaz, train, Tupelo. Bookmark the permalink. I love what you have done to the photo here. I like taking pictures but I am new to the editing of them. You inspire me to try to do more with my photos. I just purchased Photoshop and I am learning how to use it. Thanks for sharing these photos. I am always a push over for railroad images, Zann, and I like both of your interpretations of the scene.